Recurring acute injuries are not only painful and disruptive, they can also be damaging if left untreated. Treatment recommendations vary depending on each individual case, but often include a combination of the following approaches. 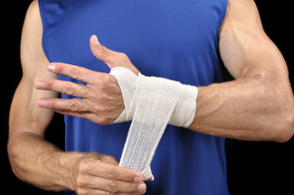 A wrap or splint that immobilizes the wrist may be recommended for daytime and/or nighttime use to help relieve uncomfortable symptoms such as numbness or tingling. Wrist wraps are available in a variety of materials that provide a range of support from total immobilization to relative flexibility. Some people also choose to wear these types of wraps as a preventive measure to limit motions that may contribute to future injuries. It is not possible to regulate the temperature of the ice pack. Putting a cold source directly on skin comes with the risk of tissue damage and bandages are difficult to apply on upper extremities without assistance. Even with the help of a healthcare professional, it can be difficult to find a comfortable hand position when wrapping an ice pack around your hand and wrist. Education about your injury and its causes. Recommendations for activities to avoid. Instructions for proper posture or body positions for certain tasks. Exercises to strengthen the muscles in your wrist and hand. Exercises to increase flexibility in your wrist and hand. Heat and/or cold treatments to help control pain. A wrist wrap or splint to help reduce discomfort. Every program will vary, but the objective is always to reduce or eliminate symptoms and create good habits that will help prevent future injury. Control the temperature of therapeutic cold. Provide consistent cold for the duration of the therapy session. Keep the hand and wrist in a natural, comfortable position. Benefit from consistent compression that actively removes excess fluid and promotes blood flow. Benefit from deeper, longer-lasting cooling. Regulating therapeutic cold is especially important for treatment of hands and wrists because temperatures that are too cold can potentially exacerbate symptoms of acute recurring injuries. Adding cold compression therapy to your recovery program is the best way to ensure the fastest rehabilitation. If you experience recurring acute upper extremity injuries or plan to have upper extremity surgery, talk to your doctor or physical therapist about the benefits of cold and compression therapy.